µWave Wizard's™ graphic modeler is directly accessible through µWave Wizard's™ modeler library. 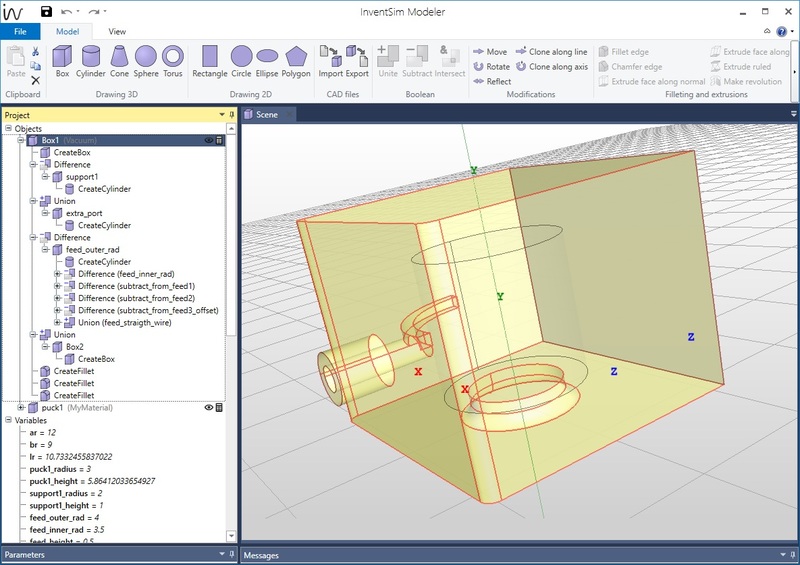 The integrated modeler is a versatile 3D editor capable of creating and modifying geometrical models of 3D and planar structures which offers a different design approach. Complex geometries are created from simple objects like e.g. boxes, cylinders or rectangles and are then modified and/or subjected to Boolean operations (union, subtraction, intersection). In other words a two-dimensional cross-sectional profile is created using 2D primitives and this profile is then extruded along a line to create a 3D structure. Whenever an object is created or modified, the action is added to the list of Constructive Solid Geometries (CSG-Tree). This simplifies and speeds up the designs and further simplifies possible modifications of the structures. Other features for construction include creation of arrays of objects using the cloning tool, fillets to create accurate models of devices manufactured with machining radii, and creating structures with ruled surfaces. The modeler also provides a simple and powerful way to modify structures once they have been built. Thanks to parameterization of all operations related to geometries, the dimensions and other parameters of structures can be quickly modified, so there is no need to build the structures again. The desired operation is easily selected on the editor and new parameter values can quickly be entered or changed. The structure is then rebuilt automatically according to the new parameters. Moreover, a flexible variable mechanism is incorporated into the modeler enabling not only the introduction of simple numerical values but also complex equations, utilizing a range of built-in predefined functions. Design flexibility is achieved by utilizing multiple nested coordinate systems. 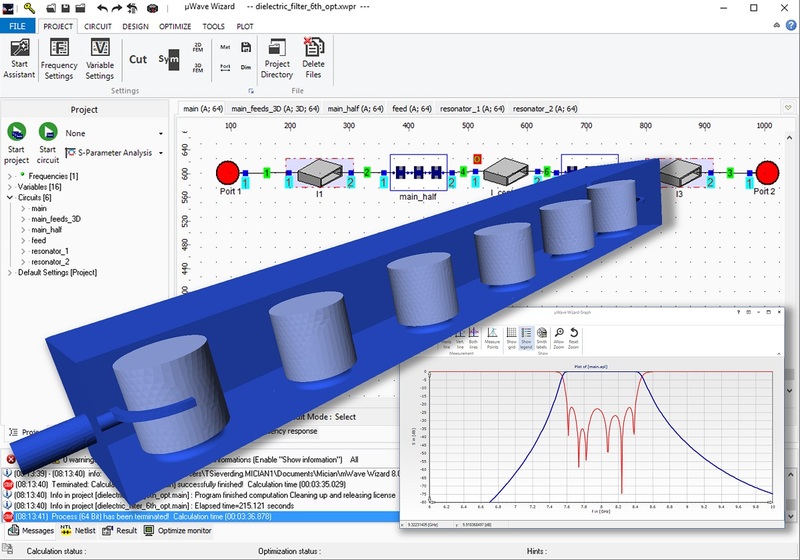 All variables are synchronized between the modeler and µWave Wizard's™ UI. The connection between modeler elements (even for complex structures) is supported by the multimodal scattering matrix. No normalization or manual sorting of modes is necessary. The corresponding waveguide ports between the elements simply have to be connected inside the schematics.